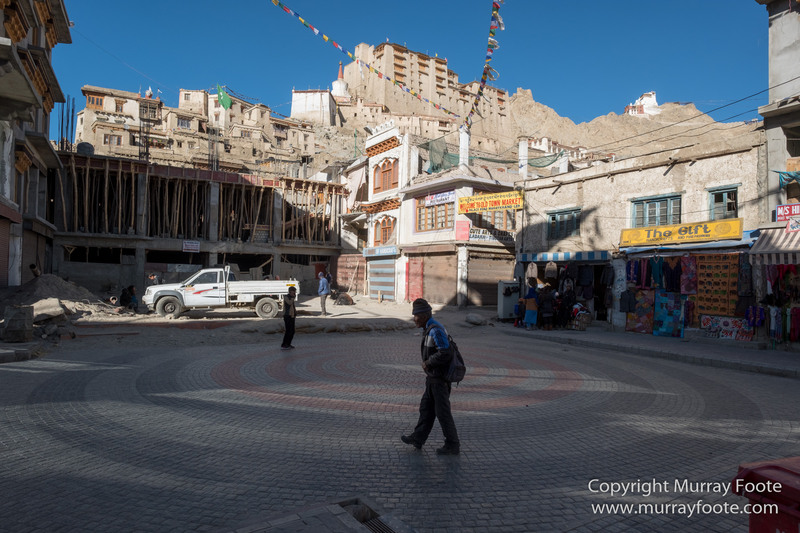 We had walked out of the National Park and we still had an afternoon in Leh. 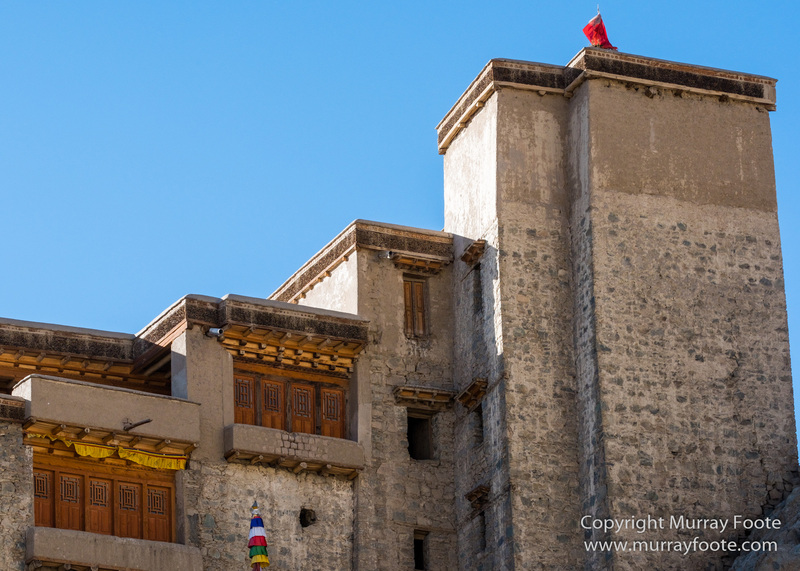 We chose to visit Leh Palace and I combine those images with a few I took in our earlier stay in Leh. 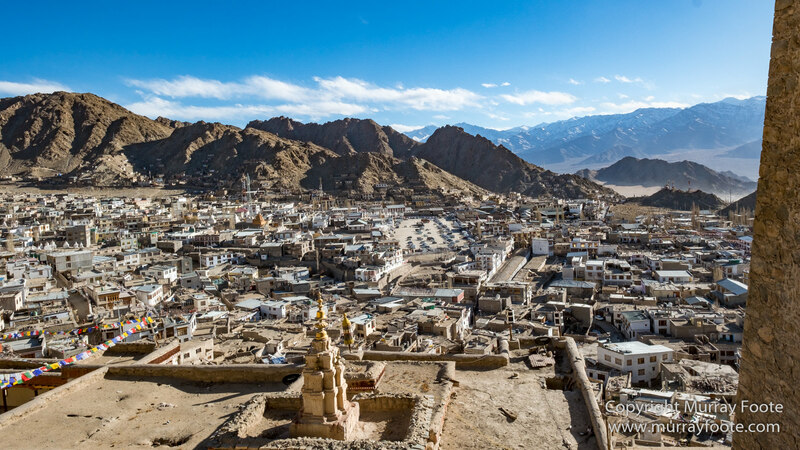 On the skyline of Leh, high above Leh Palace, is Tsemo Fort (the upper white structure), built between 1555 and 1575 by King Tashi Namgyal. 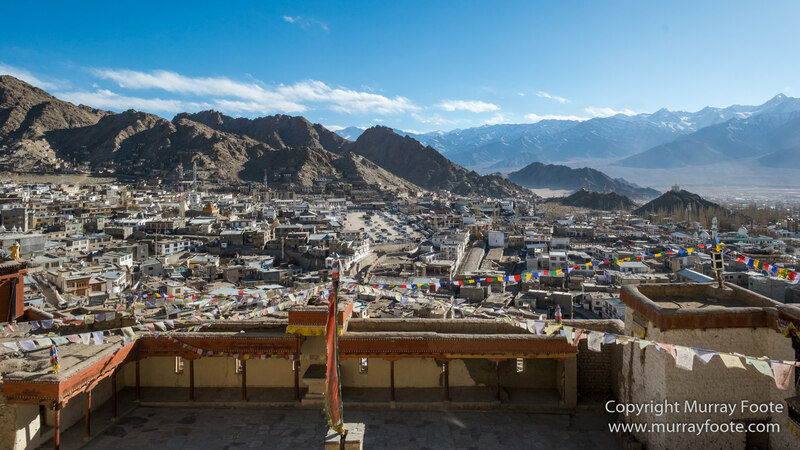 The buildings below it are Tsemo Gompa or Monastery, built by King Tashi Namgyal in 1430. It houses an eight-metre high gilded statue of Buddha. Access is difficult because of a steep climb from a road and fleeting and uncertain opening hours. Women are only allowed access when the statues are veiled. 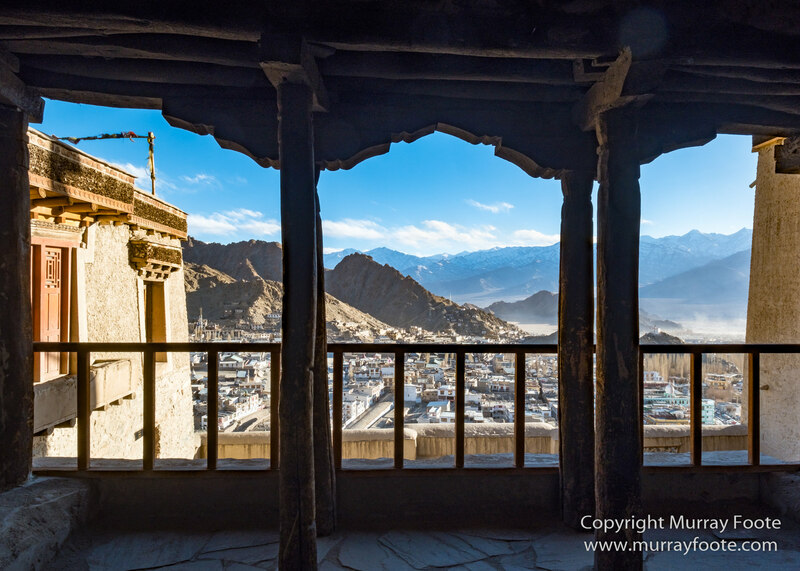 This and the next image was taken from the roof of the hotel we were staying in during our first afternoon in Leh. Sunset over the distant mountains. 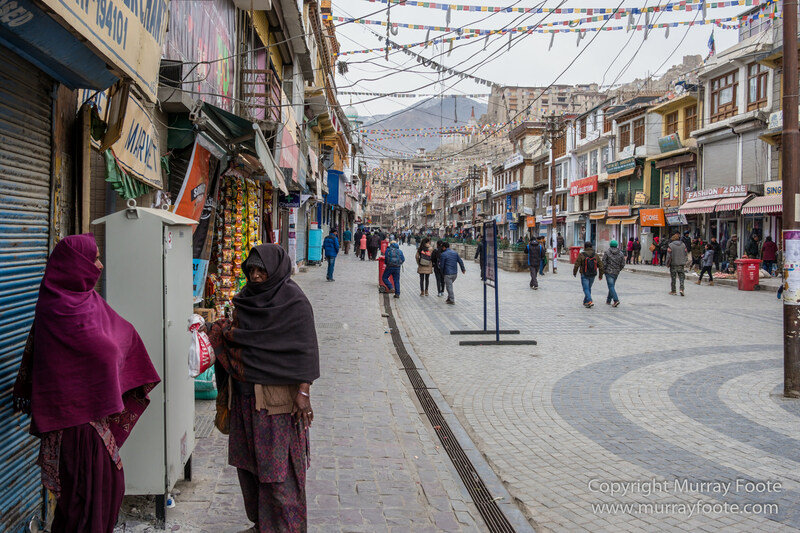 The main street of Leh, Main Bazaar Road, the next morning. The far end of the same street, after returning from the National Park. 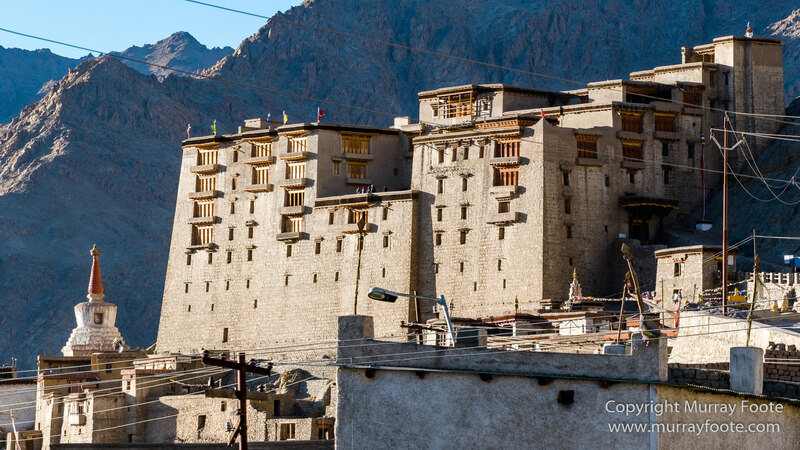 Leh Palace is on the middle skyline and Tsemo Fort on the right skyline. 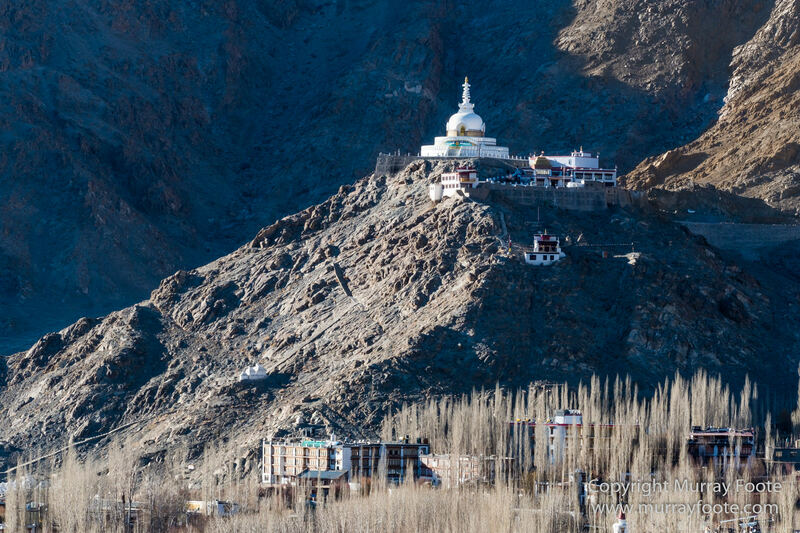 It would take a long time to walk from Leh to the Palace, especially at altitude and with the maze of roads. We took a taxi up and the road comes in from the side. This is a corner of the top of the palace as we walk in. 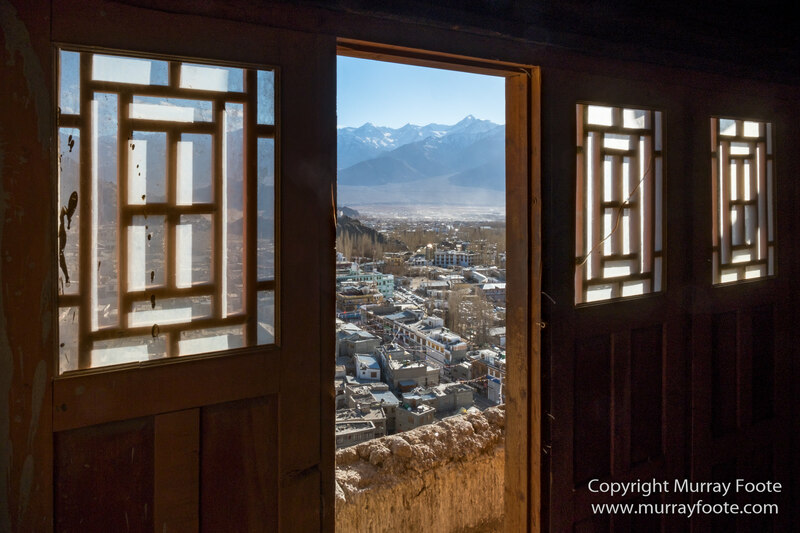 Looking out over Leh from the path into the Palace. 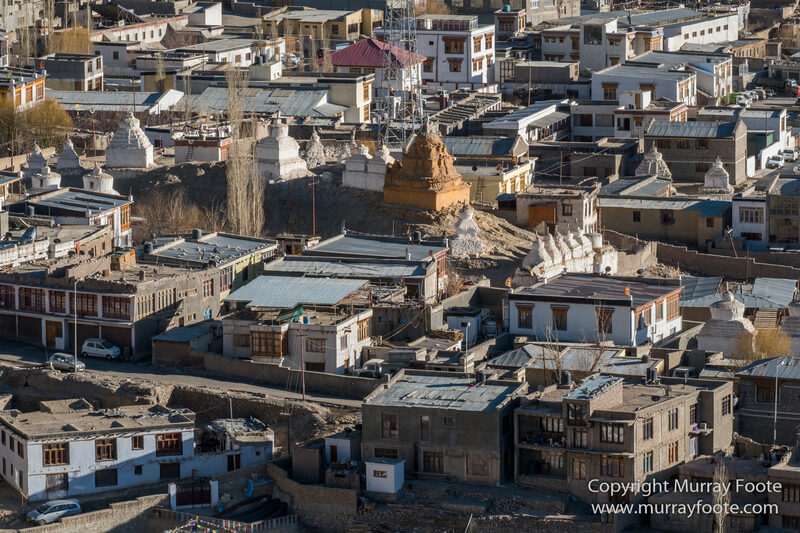 In the foreground is Soma Gompa, a monastery built below the Palace in 1840 but disused since the 1950s when a replacement was built in town. Another view out over Soma Gompa. The huge “carpark” in the distance is the Polo Ground and it’s not a relic of British India. Polo originated in Persia and is said to have come to Central Ladakh from Baltistan, just north of Ladakh, now primarily Moslem and occupied by Pakistan. King Jamyang Namgyal is said to have introduced it in the 16th century who married Gyal Khatun, a princess from Baltistan. A few months before we arrived, polo was being played here during the 2017 Ladakh Festival. The main door to the Palace. 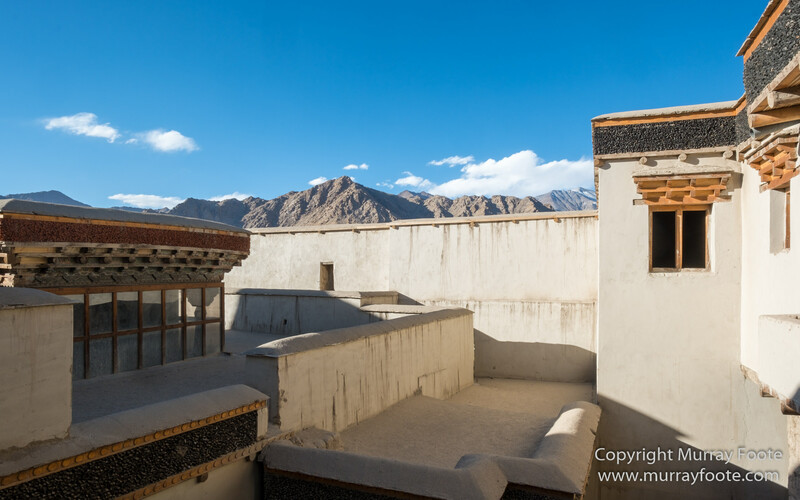 Construction of the Leh Palace started in 1553 by Tsewang Namgyal, founder of the Namgyal dynasty, and it was completed by Sengge Namgyal (“the Lion King) who died in 1642. 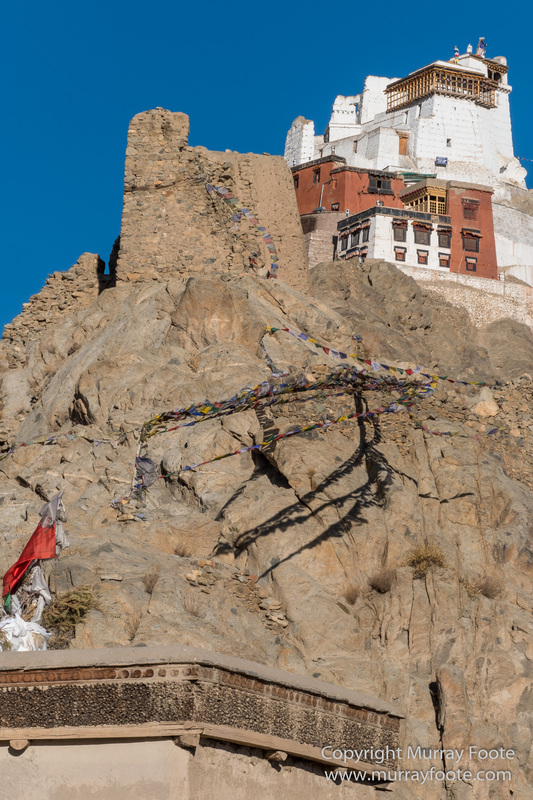 It predates the Potala Palace in Lhasa, for which construction commenced in 1645. The palace has nine stories. The ground area was used for stables, the first floor for storage and the second by servants. The King’s Audience Hall, the Tsokhang, was on the fourth floor and the King and Queen’s private areas were on the fifth floor. The three floors above that were wholly or in part for religious use. 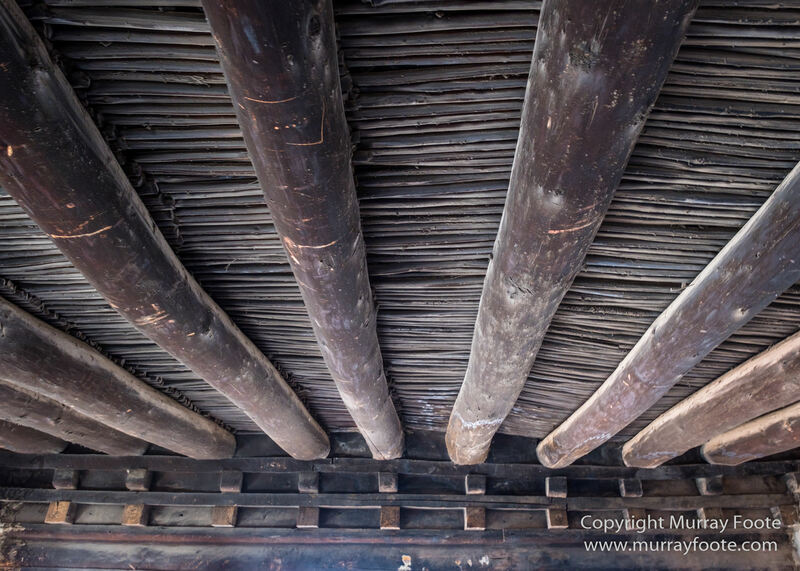 A detail of the ceiling of one of the interior rooms. 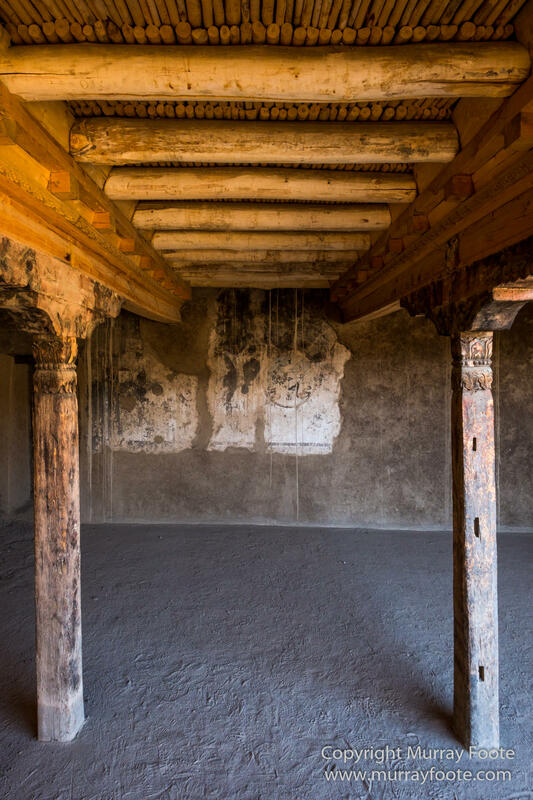 Remarkably, the palace has no foundations but the inwards sloping walls assist with stability and alternating layers of stone and wood provide elasticity to help withstand earthquakes. Stairs leading up to the highest level. The palace was sacked by invading Tibetan and Mongolian forces in 1685. 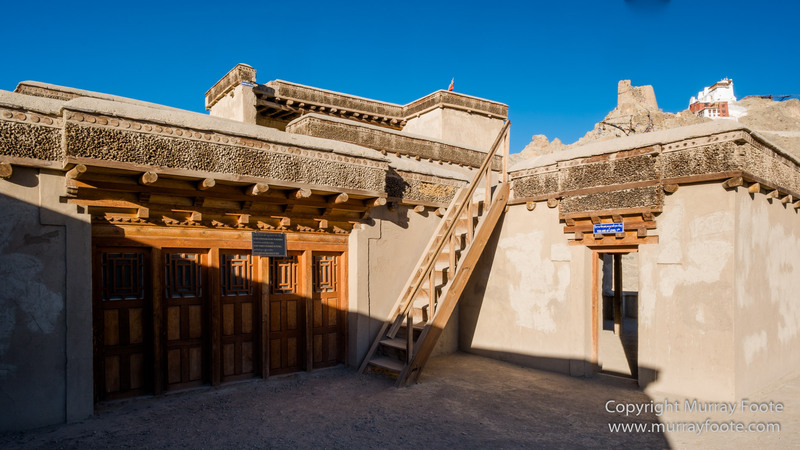 It was also severely damaged by Zorowar Singh’s forces in 1836 and the royal family moved out from that time to their current residence of Stok Palace on the other side of the Indus. An upper floor room including faded remains of a very damaged wall fresco. The palace is mainly empty apart from the Royal Shrine and some photographic displays. Photography was not permitted in the shrine but there are images from there in Kevin Standage’s blog. There were magnificent views available from the roof of the palace. This is Shanti Stupa, a new and elaborate chorten built in 1991. 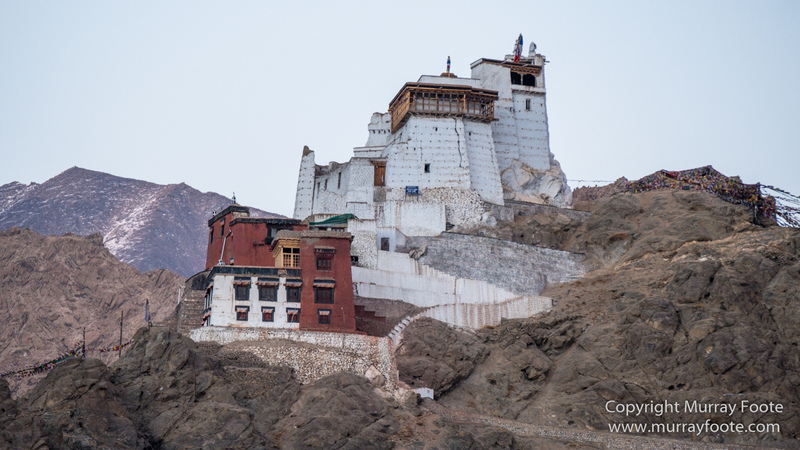 A view from below of Tsemo Fort and Monastery. There was originally a structure here built by the Dards in the 5th century and some of the ruins of that is probably what you see on the near skyline. Still in the palace and on the way down now. A view from one of the rooms. 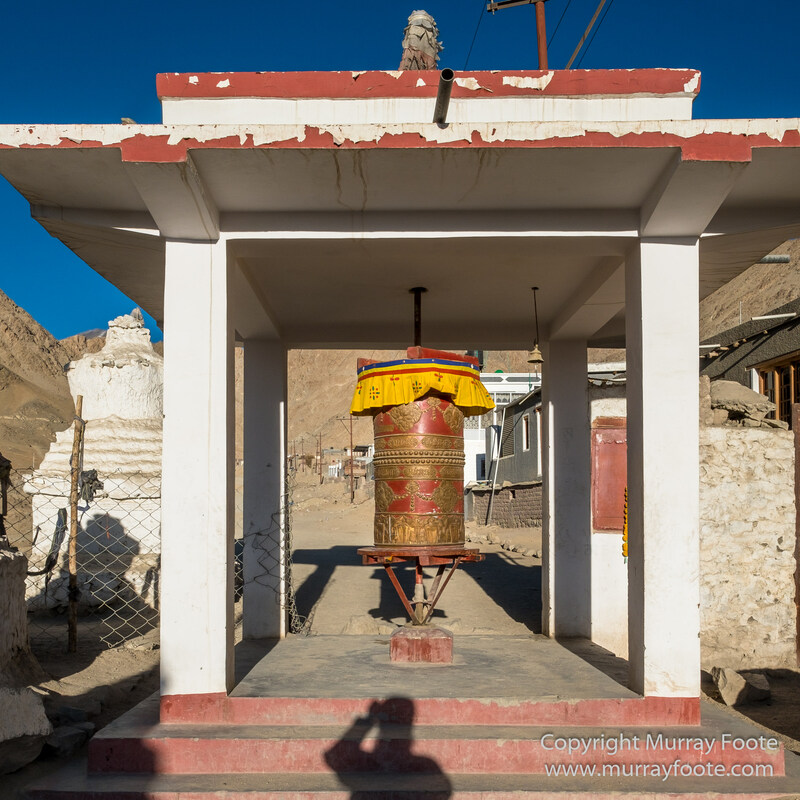 A prayer wheel beside the road to the palace, incorporating a gate to I think a residential area. A view of the palace in the late afternoon sun. 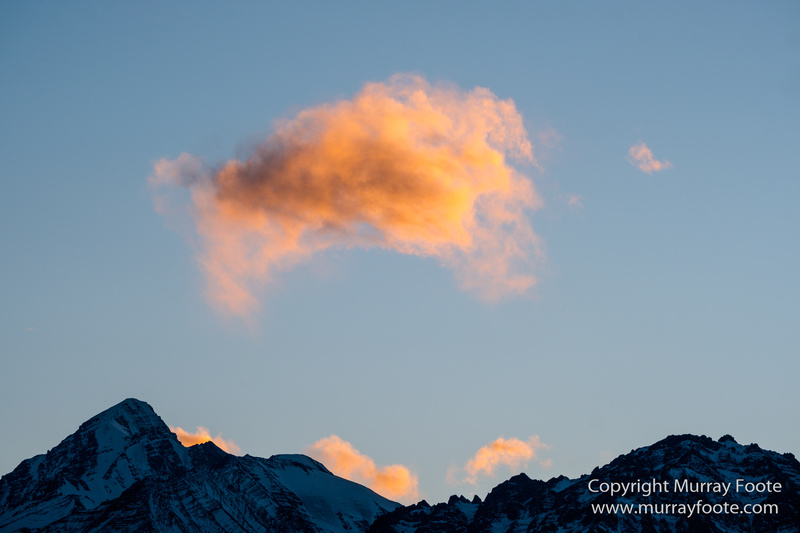 That was the last post for the Ladakh trip, apart from monochromes. Next will be a live music post, an exhibition post, and some monochrome posts from this trip. After that l will be posting on the Atacama to finish off the posts for my 2015 Madagascar/ South Georgia trip. 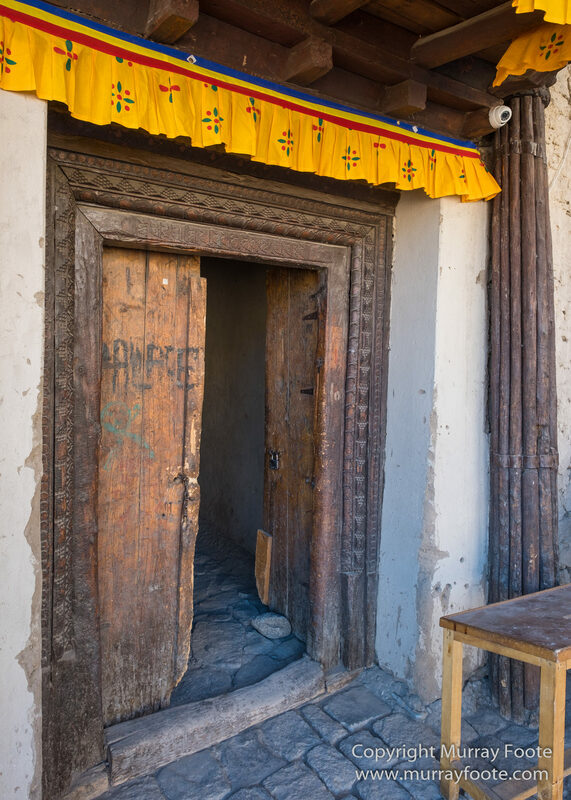 This entry was posted in Australia and tagged Architecture, India, Ladakh, Landscape, Leh, Leh Palace, Nature, Photography, Street photography, Tibet, Travel. Lovely way to wrap up your adventure. Yes, I’d read about the palace and definitely wanted to visit it. Beautiful ,& visually spiritual ! Yes, a very special place.